CorePlayer™ Mobile and Pro are at the center of the CoreCodec™ Universe for manipulating multimedia content on your desktop, mobile phone, portable media player, PDA, GPS, or convergence device. 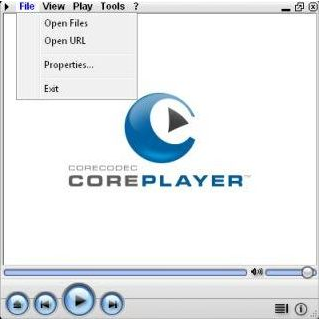 CorePlayer is designed to be a next-generation multimedia platform that will extend upon what you thought were limits in playing back fluid multimedia, with its simple yet extremely powerful interface and features that is designed to empower the CoreCodec Community. See why companies like Joost, SanDisk, DivX, NeoNode, Elgato and more are using CoreCodec technology and why the Chicago Suntimes times says that CorePlayer, "actually has a user interface designed with bipeds in mind." CoreUI 'Universal skins' Widget. Allows you to create a unique custom user interface exactly how you want it!